The HONEYWELL-POWER-HPF24S8 is a compact, 8-amp power supply with a built-in battery charger. 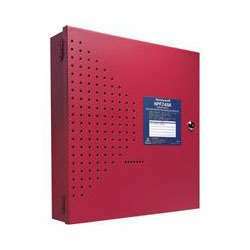 This connects to any 12 or 24 volt Fire Alarm Control Panel and provides power to additional fire alarm devices. During a power failure, the battery automatically continues to provide power to the panel. LED indicators provide visible alerts for diagnosis, troubleshooting, and status conditions. This power supply works with just about any UL 864 fire alarm.